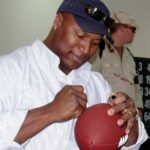 Bo Jackson is a former baseball and American football player. He is one of the few athletes to be named an All-Star in two major sports, and the only one to do so in both baseball and football. He is widely considered one of the greatest athletes of all time. While at Auburn University, Jackson won the 1985 Heisman Trophy, annually awarded to the outstanding collegiate football player in the United States. Jackson was inducted into the College Football Hall of Fame in 1996. Jackson was originally drafted first overall by the Tampa Bay Buccaneers in the 1986 NFL Draft, but refused to play for the franchise. Jackson instead entered the following year’s draft, being selected in the seventh round (183rd overall) by the Los Angeles Raiders. "I also tell them that your education can take you way farther than a football, baseball, track, or basketball will – that’s just the bottom line." "Set your goals high, and don’t stop till you get there." "If you have four years to complete your college education, do it." "I was the type of guy that used to get up in the morning and go out and just out run everybody on the field without stretching or warming up or anything." "Don’t sell yourself short because without that you can’t go far in life because after sports the only thing you know is sports and you can’t do anything else with that."